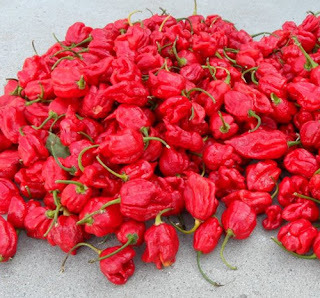 Trinidad scorpion peppers are the hottest peppers in the world, and will actually blister your skin if you touch the oil. If Clive Barker bred his own pepper, these would be it. (1,500,000 Scovilles; compare to a jalapeno's 8,000.) Back in May, for some sadomasochistic reason, my friend had a party where he invited people to a feast of these Lovecraftian abominations. Surprisingly, some idiots accepted his invitation. Not surprisingly, all of them had Y chromosomes. Even less surprisingly I was among them. The reason I'm posting this here is because my otherwise inexplicable behavior afforded me a chance to test a theory. Years ago, I'd noticed that when I'd put too many jalapenos on something, a minute later I ate some spicy but not really hot barbecue sauce, and thought I noticed that the heat abated quickly. If the heat is caused by different capsaicinoids (a critical assumption as it turns out!) it's possible the barbecue sauce capsaicinoid acted as a partial agonist at the receptor, decreasing the heat from the jalapenos. The agonist for the current experiment would be the scorpion pepper, and the partial agonist, Tabasco sauce. Many of the people at the party were medicinal chemists who were interested in this hypothesis; specifically, in watching someone else test it. Medicinal chemists are bad people. But I don't think this can be considered a valid result until it's replicated. Perhaps you would be interested in being a subject? Now along comes a new Ramachandran paper with David Brang (previously at UCSD, now at Northwestern) using made-up characters in varying colors. Grapheme-color synesthetes have a harder time learning new color-character associations than the rest of us. Extending to dyslexia, it's as if synesthetes' neuronal connections are richer but less trainable. Color-grapheme synesthetes report that it's unpleasant when real characters are printed in colors other than their "normal" synesthetic ones, much like they're constantly taking a Stroop test. Japanese anatomists have shown that careful dissection of the upper lip shows vestigial vibrissae (whisker) muscles in a third of humans. You know how your cats whiskers go back if you touch them there or they're just annoyed about something? Those. Apes are strange among mammals for not having vibrissae; in particular rodents are thought to construct their pictures of near-space with their whiskers rather than their eyes, and interestingly vibrissae sensory nerves are afferent trigeminal fibers, many of which pass through the superior colliculus, a midbrain visual structure. "Electroencephalographic Topography Measurements of Experienced Utility", emphasis on experienced. Pedroni A. et al, The Journal of Neuroscience, 20 July 2011, 31(29): 10474-10480. The response they measured unexpectedly increased disproportionately increasing reward, i.e. it did not demonstrate diminishing returns but rather the opposite. A measure of the mismatch between decision and reward utility, and understanding its biological basis and how it differs between individuals, would be excellent for psychology as well. Armstrong and Woodley argue that the documented rise in measured IQs is a result of test-takers applying rule-based approaches to tests, resulting in an increase similar to that seen in re-testing. They're arguing that in large part, it is a testing artifact. They make several predictions about what we should observe if their rule-based model is correct. For instance, that measures of crystallized intelligence (i.e. vocabulary) should not rise or not rise as robustly, and they haven't; that most obviously rule-based tests (like Raven's progressive matrices) should show the strongest effect (they do); and that we should expect the gains to appear when countries undergo demographic transition including standardized education, and the rate of increase should correspond to the rate of the transition. To this last point, it's worth pointing out that there are many other less interesting medical explanations for why intelligence might actually be rising. Specifically, lower parasite load due to public sanitation and better nutrition in early childhood are very good candidates for why the Flynn-type gains are most pronounced in Europe, Japan and Korea in the periods when they were observed. It's hard to make the argument that lower parasite load leads to better cognitive strategies to game tests. It's also not surprising that if bombs are falling around your school and then they stop, the people tested after they stop may perform better - especially since even non-warfare jet and traffic noise has been shown to locally impair reading comprehension in students. A second, neglected question is whether the abstract rule-based thinking required for the re-testing-type gains actually correlates to some other outcome, like personal or national per capita income, or life satisfaction. If the Flynn effect doesn't represent an increase in g but does correlate with economic growth, do we care that much? Armstrong EL and Woodley MA. The rule-dependence model explains the commonalities between the Flynn effect and IQ gains via retesting. Learning and Individual Differences, Volume 29, January 2014, Pages 41–49. Eppig C, Fincher CL, Thornhill R. Parasite prevalence and the worldwide distribution of cognitive ability. Intelligence 39 (2011) 155–160. Haines MM, Stansfeld SA, Job RF, Berglund B, Head J. Chronic aircraft noise exposure, stress responses, mental health and cognitive performance in school children. Psychol Med. 2001 Feb;31(2):265-77.